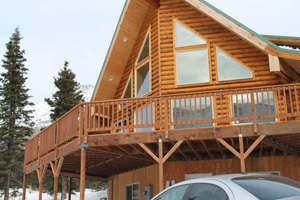 Alaskan made Alaska spruce Superior Logs “Authentic” log siding is cut from half of our 6″, 8″ or 10″ diameter, Swedish coped, precision round milled Superior Logs. The siding is in random lengths from 2′ to 12′, clear poly wrapped, metal strapped & end “X” braced for easy handling. Bundles weigh approx. 2,500 lb. The siding is 19% or less moisture content so it won’t create gaps after it is applied. The siding can be nailed top & bottom to your frame studs with a 12d to 20d galv. finish nail depending on the log diameter selected. On new construction we use 2″ to 3″ lag screws in the thickest part from the inside of the exterior sheath between the studs. Apply to the exterior sheath (with air barrier) after removing other contoured siding materials if remodeling & nail to the flat surface. The Swedish cope is a drip cap so no gaskets or caulking are needed. This is an authentic log siding, not a planed 2 X 8. 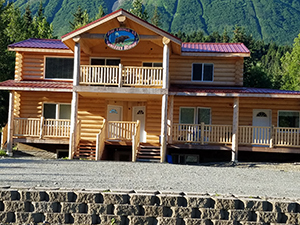 One third of the Kenai Princess Lodge at Cooper Landing & the Mat-Su Visitor Centers gable ends, Mile #1 Parks Highway are covered with our authentic, Alaskan made Superior Logs siding & patrons don’t know it!! 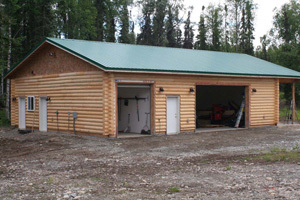 6″ Superior Log siding covers 5 1/2″ (reveal) per course: The price is $4.00 per lineal foot or approx. $8.72 per square foot plus delivery. Saddle corners are $8.00 per lineal foot. Use 17 courses (93 1/2” approx.) for an approx. 8’ wall. 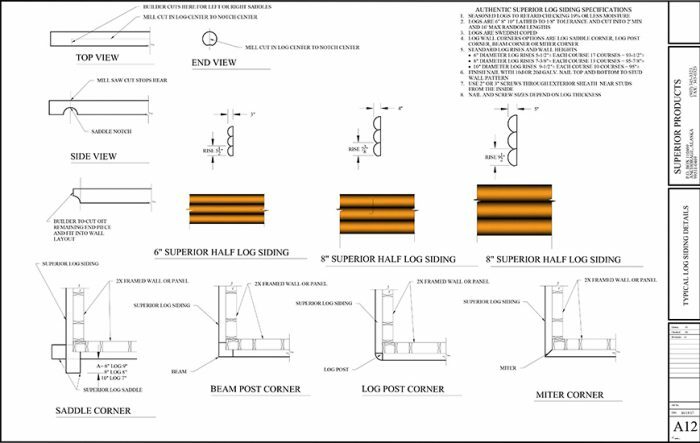 The standard saddles extend 9” past the wall.8″ Superior Log siding covers 7 3/8″ (reveal) per course: The price is $6.50 per lineal foot or approx. $10.57 per square foot plus delivery. Saddle corners are $13 per lineal foot. Use 13 courses (95 5/8” approx.) for an approx. 8’ wall. The standard saddle corner extends 8” past the wall.10″ Superior Log siding covers 9 1/2″ (reveal) per course: The price is $9.00 per lineal foot or approx. $11.36 per square foot plus delivery. Saddle corners are $18.00 per lineal foot. Use 10 courses (95” approx.) for an approx. 8’ wall. The standard saddle corner extends 7” past the wall.All prices are FOB the Mill Site. Delivery is Extra!! To estimate your price, figure total wall square footage, saddle corners (number of courses X 2) if desired, deduct the openings & other areas not receiving siding (doors, windows, fireplaces, etc.) square footage from the total wall square footage, then add 10% for waste. NOTE: You must double the saddle corners for an accurate total. We cut the half logs for you at no extra charge so the saddles are authentic. You provide a simple sketch of the exterior or interior areas receiving the siding for us to make the right number of pieces. If new construction, send us your plans & we’ll calculate the siding for you. Make sure to let us know if you intend to cover above the 8′ height (truss heels, rafter heels, gable ends, dormers, etc. ).